Today has come to be known as Sowing Sunday here at the Zia Maison. The Mediterranean vegetables that like a nice long season are sown today: tomatoes, aubergines, chillies, peppers, and also the first tranche of basil and lemon grass, if there is none left from last year (and there never is). It feels like the right time to sow all of these, although I have started tomatoes earlier and will sow another batch later – the first lot will hopefully begin to ripen before any blight strikes and the second wave can take advantage of an Indian summer, should we be lucky enough to have such a thing. However, there’s nothing significant about the date except that it’s the Sunday at the end of half-term, which makes it easy to remember. Most of the packets for the seeds I used today say ‘Sow Feb-Mar’ or ‘Sow in early spring’ and it can be frustratingly difficult to know when the best time within that window might be. It’s not even so much about whether we’re under snow in February or enjoying early spring sunshine, since the seeds will all be sown in a heated propagator anyway. It’s more to do with what the weather will be doing in 4-6 weeks time, when the seedlings need potting up, on, or even outside altogether. Kept in tiny windowsill pots too long, they’ll grow leggy and weak; transplanted too late they won’t set fruit until late summer, but then again, plant out too soon and the cold nights could finish them off. It’s no wonder gardeners have come up with some easy-to-remember traditions for sowing and planting. 'Plant garlic on the shortest day and harvest on the longest', for example. In truth, garlic will grow best if planted just before the temperature plummets towards zero for a 10-day chill … so, yes, just before Christmas seems like a good bet. Leeks should be transplanted on the longest day as well, apparently. Mine are usually more like blades of grass in mid-June, but the saying does serve to remind me that it’s a job moving inexorably towards the top of the to-do list. It’s also traditional to plant potatoes over Easter weekend, which could make you a hostage to fortune given that Easter can fall at any time between late March (which would leave your spuds very vulnerable to frost) to late April (fine for maincrops, but cutting it fine for your earlies). 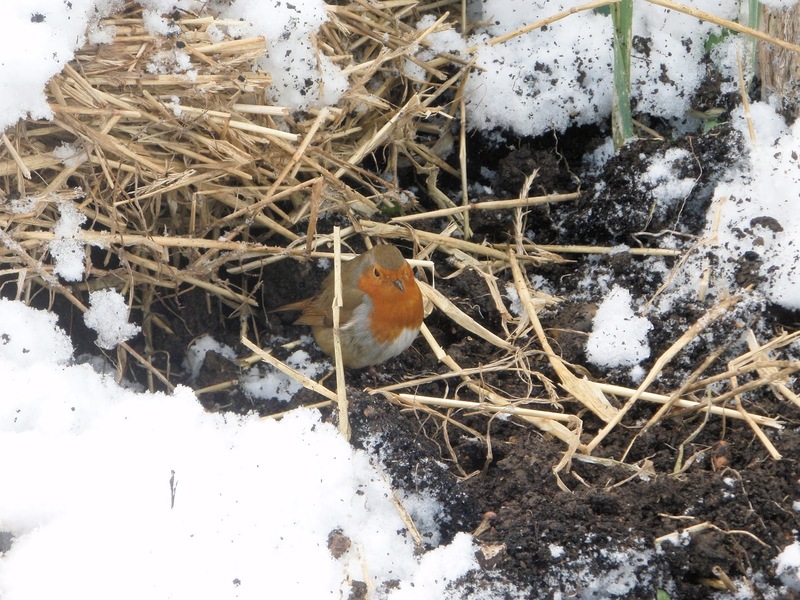 A snowy visit to the allotment today. The fresh snowfall has flattened out the landscape and deadened any sounds, so that it seems perfectly quiet and still, just the crump-crump of my wellies stumping down the path. 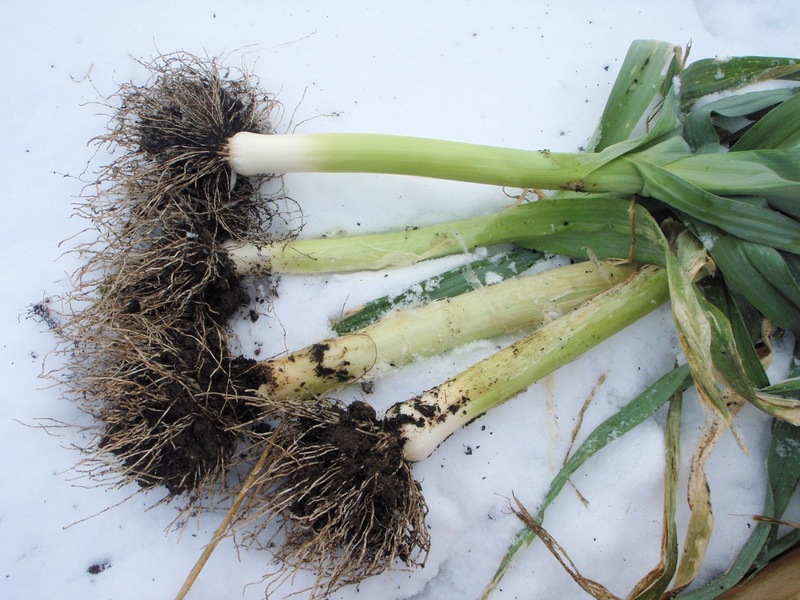 Apart from making sure everything was all right under its blanket of snow, I wanted to dig up some leeks for supper. 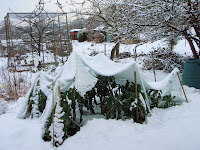 Despite a good 8cm of snow, the ground wasn't frozen, so the leeks were easy to lift. 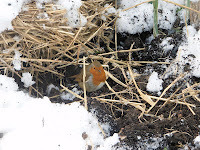 Disturbing the soil alerted my winter robin, who earned himself a breakfast of two fat worms while I was digging. The brassica cage here shows what happens if you don't take the net down before the snow falls - the weight of snow on the net will have knocked the tops of most of the plants. Last year this happened with my purple sprouting broccoli long while they were still maturing. This year, the purple sprouting broccoli cropped in September and we've been eating it ever since, so it's coming to the end of its productive life anyway. Ginger is a sub-tropical plant; most of the ginger root that we buy in the shops comes from India, China and other parts of south-east Asia. It's an attractive, exotic-looking specimen with deep green blade-like leaves and a red or pinkish flower spike. Leafing through Jekka McVicar's indispensable Complete Herb Book, I came across her notes on ginger - the very last plant in the book on account of its Latin name Zingiber officinale - particularly the notes on cultivation. I've heard good reports from others on growing ginger in the UK - indoors, yes, and as much for the beauty of the plant as the cultivation of the edible rhizome - and this unearthed a long-forgotten ambition to grow my own ginger. The first challenge is that you need to find a fresh ginger root that might easily sprout, that is, one that already has a yellow (or even better, green) bud developing, rhino horn-like, from the main root. Often the roots on sale in the shops have been treated at source to prevent sprouting so that they can be stored for longer. I got lucky last week. As so often happens, I wasn't really looking for sprouting ginger, but there were a cluster of rhizomes at the bottom of the box in our local mini-mart that had obviously escaped the treatment process and had tiny yellow nodules poking through the skin. The best way to start them off here in the UK seems to be agreed upon by both Jekka and Kew Gardens - that's a good enough consensus for me. Place somewhere warm and light. The shoot needs temperatures above 20 degrees C to develop, so a heated propagator, conservatory or warm windowsill are your best options. Wait around 3-4 weeks to see shoots emerging. We're at stage 7 at the moment, with fingers crossed.